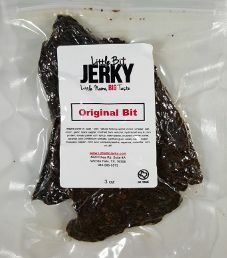 The next review on Little Bit Jerky will be on a 3 ounce/85 gram bag of their original bit beef jerky flavor. 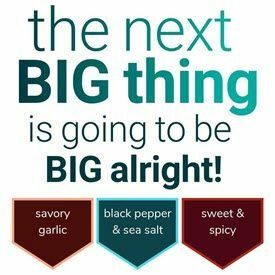 This flavor is described as their signature blend of Texas spices marinated to perfection. The jerky was graciously submitted for review by one of the co-owners, Teresa Helmcamp. 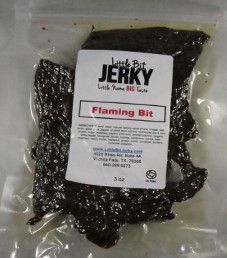 The next review on Little Bit Jerky will be on a 3 ounce/85 gram bag of their Flaming Bit beef jerky flavor. This flavor is described as being full on fajita flavor with a touch of heat. This bag of jerky was kindly submitted for review by one of the co-owners, Teresa Helmcamp. 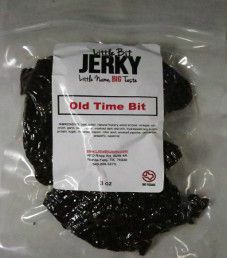 The next review on Little Bit Jerky will be on a 3 ounce/85 gram bag of their old time bit beef jerky flavor. This flavor is described as a traditional beef jerky flavor, the way it was way back when. The jerky was kindly submitted for review by one of the co-owners, Teresa Helmcamp. 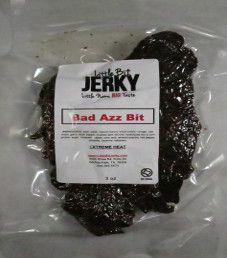 The next review on Little Bit Jerky will be on a 3 ounce/85 gram bag of their bad azz bit beef jerky flavor. This jerky was graciously submitted for review by one of the co-owners, Teresa Helmcamp. 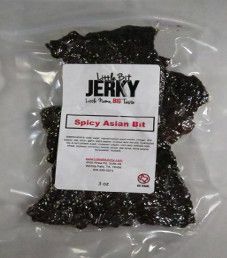 The first review on Little Bit Jerky will be on a 3 ounce/85 gram bag of their Spicy Asian Bit beef jerky flavor. This jerky was kindly submitted for review by one of the co-owners, Teresa Helmcamp.